2016 Nissan Sentra Pros and Cons: Why (Not) This Car? A compact car can no longer hope to get by on a low price alone (though one doesn't hurt). In recent years compacts have improved so dramatically in just about every way (save price) that they've become the cars of choice for many people who could easily afford something larger. For a model to remain competitive, it must improve at least as much as competitors. To this end, Nissan treated the Sentra to an unusually extensive mid-cycle refresh for 2016. The compact sedan received a new face, improved handling, improved quietness, and new high-tech features. But is this enough? A key test: how well does the revised Nissan Sentra compare to the segment leader I compared it to three years ago, the Honda Civic? Back in 2013 the Civic received a highly unusual number of second-year changes. This crash program addressed widespread criticisms (mine among them) of the 2012. While these changes helped, they were clearly a stopgap. For 2016 the Civic has received a much-needed full redesign. Game on. Piano black trim has replaced faux wood and silver plastic. Ambiance remains relatively traditional. Why the 2016 Nissan Sentra? Three years ago I was able to identify five reasons to buy a Nissan Sentra over a Honda Civic, and this was only because five is the maximum within our format. For 2016, you'll no longer find fuel economy, interior materials, and ride smoothness among these, and even price is conditional. One that remains: quietness. The Sentra was already among the quietest compact sedans before the 2016 improvements, and it's even quieter now. Note, though, that the engine makes a fair amount of noise under hard acceleration, with the CVT (continuously variable transmission) holding it oddly steady at a high rpm as the car gains speed. This could be worse: the 1.8-liter engine could be louder and more buzzy, like the engine in the Honda Fit. For 2016, the non-sporting trims of the Civic are available with two four-cylinder engines, a 158-horsepower 2.0-liter and a 174-horsepower turbocharged 1.5-liter. I tested a new Civic with the latter. The new turbo engine's additional torque (162 lb-ft at a low 1,700 rpm, vs. the 2.0's 138@4,200 and the Sentra 1.8's 128@3,600) means that it doesn't have to be revved nearly as much as the Nissan's engine in typical daily driving. If you do have to rev it, or simply want to, the quality and quantity of engine noise is lower and less objectionable than in the Nissan. But, continuing the Honda curse despite repeated efforts to lift it, the new Civic suffers from relatively high levels of road noise on concrete highways. Honda increased the capacity of the Civic's trunk, but only to the point that it ties the Sentra's nearly class-leading 15.1 cubic feet. The Civic's rear seat continues to lack a split. In the Sentra you have the option of folding only part of a 60/40 split rear seat, retaining space for one or even two passengers. Tall for a compact sedan. Complex surfacing reduces the apparent height of the body sides. Conventional instruments and logical controls. Infotainment display too low. Price also remains a Sentra advantage, but only if you don't adjust for feature differences and ignore the Honda's general superiority. Pricing for the Nissan starts at $17,615, $1,860 less than a Civic LX. The Civic includes about $400 in additional features. Both cars offer safety tech packages that include adaptive cruise control, a welcome recent development in the compact sedan class. The least expensive Sentra with this package lists for $25,065, while the least expensive Civic with it lists for $24,035, a bit over $1,000 less. But the Sentra SR and SL in this comparison include additional features worth about $2,000. Adjust for these, which include leather upholstery and navigation, and the Nissan regains its advantage. Require leather and nav on the Civic, and it lists for $1,470 more than a Sentra SR and $1,170 more than a Sentra SL, while including about $200 in additional content. In all three cases the Sentra's price advantage after adjusting for feature differences is about $1,000. This isn't pocket change, but as we'll see it also isn't hard to justify. Why Not the 2016 Nissan Sentra? 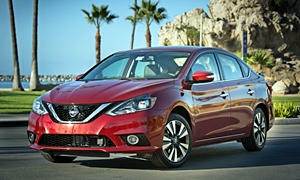 The 2016 Nissan Sentra continues with the same 130-horsepower 1.8-liter engine as the 2013. This engine didn't deliver competitive performance back in 2013, and it's even further behind in 2016. The Civic's new 174-horsepower turbocharged 1.5-liter engine is far more powerful and doesn't sound nearly as strained. You cannot manually shift the Sentra's CVT (continuously variable transmission) among simulated fixed ratios the way you can with some such transmissions. This prevents anything resembling precise, predictable control over engine output, limiting driver confidence and killing any joy that might be had on a curvy road. The new Civic's CVT at least has a sport mode that makes it somewhat more suitable to performance driving. Different people are shaped and sized differently and so will have different impressions of a given car seat. I found the Nissan Sentra's revised seats uncomfortable. A power lumbar adjustment has been added. But this was of no use, as even when minimized the lumbar bulge is overly prominent for my back. I drove with my upper back off the seat. I've had a similar problem with the seats in some small Hondas, but the seats in the new Civic fit me well. For 2016 the Sentra gets the same grille as other current Nissans. It's an improvement. Plenty of rear legroom. Rear headroom is in much shorter supply. Compared to the new Honda Civic, the Nissan Sentra is an inch-and-a-half narrower and three inches taller. The cars' driving positions differ accordingly. 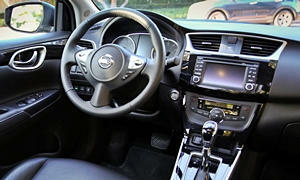 The Sentra's driving position is very much that of a small car, high within a narrow interior. This benefits outward visibility but depresses perceived value. In sharp contrast, the Civic's driving position is that of a midsize car. Not only do you sit lower than in the Sentra, but there are over two inches of additional shoulder room, a midsize-like 57.0 vs. 54.7 inches. A lower seating position can harm outward visibility. But Honda has also junked the 2006-2015 Civic's massive bi-level instrument panel in favor of one that isn't nearly as tall or as deep, dramatically improving the view forward from the driver seat. Both Nissan and Honda position the display for the infotainment system below the air vents, where it is too low to view without taking your eyes well off the road. This is more of a problem in the Sentra owing to its higher seat relative to the instrument panel. Some people might not like how the display stands up on top of the instrument panel in the Mazda3, but it is much easier and safer to use this way. In 2013 the Nissan Sentra topped its class in fuel economy (excluding some low volume special fuel economy variants, such as the Sentra's own FE+ S). For 2016 the Sentra's EPA ratings have declined by one mpg, to 29 city / 38 highway. Meanwhile, the new turbo engine boosts the Civic's ratings from the 2013's 28/39 to 31/42. Not a big difference in percentage terms, but the Honda's figures are quite impressive when you also consider its much stronger acceleration. Nissan's tweaks to the Sentra's suspension for 2014 and again for 2016 tightened up the car's handling (though they've yet to make it remotely fun to drive) at the expense of a formerly cushy ride. The Sentra still rides fairly well for a small car, while handling with commendable stability, but its front suspension sometimes fails to take the edges off bumps. In comparison, the new Honda Civic rides better and handles much better, with flatter cornering and quicker, more communicative steering. (The Sentra's tiller could hardly be less engaging.) The Honda still understeers (plows towards the outside of a curve) more readily than a proper sport sedan, and its tires limit both grip and handling sharpness. But the next Civic Si, not to mention the upcoming 306-horsepower Civic Type R, promises to be a very fun car to drive. Nissan offers no such performance-oriented variant of the Sentra, just an SR which differs from the tested SL only in trim. On paper the Civic now offers about as much rear legroom as the Sentra, but its front seats are positioned too low to the floor for rear seat passengers to comfortably fit their feet beneath them--effectively reducing rear legroom by a few inches. In the Sentra, while rear legroom is surprisingly plentiful (if still short of the Toyota Corolla and VW Jetta in this regard), rear headroom is in short supply. Passengers over 5-10 are likely to become familiar with the headliner. For 2016, the Nissan offers the Sentra with packages that include adaptive cruise control, forward collision warning, automatic braking, blind spot warning with rear cross-traffic detection, and a power driver seat. Leather upholstery, dual-zone automatic climate control, navigation, and a sunroof remain available. As impressive as this feature list would have been in an affordable compact sedan as recently as a few years ago, all of these features have become somewhat common. The new Civic offers all of them (except for the blind spot warning system; it has a passenger-side blind spot camera instead) and more: lane departure warning, lane keeping assist, a power passenger seat, and heated second row seats. The Sentra's new, Maxima-like front end for 2016 does nothing to fix a body that is too tall and insufficiently long to pull off the Infiniiti-like undulating body sides. The Sentra might appear somewhat upscale, expecially compared to the 2012-2015 Civic, but it won't be winning any design awards. The new Civic, on the other hand, could sell to many people on the basis of its exterior styling alone. It appears sporty, upscale, and just flat-out attractive (if possibly a little busy, with a detail or two too many). All of this with a more comfortably raked windshield than the 2006-2015 Civic's. Inside, the Sentra somewhat successfully attempts a traditional luxury vibe, Lexus-lite if you will, while the new Civic appears sporty and ultra-modern, yet without the sci-fi excesses of the previous two generations. The extra-tall, extra-deep bi-level instrument panel is thankfully gone, paying big benefits for the driving position and view forward. I don't know what Honda was doing to limit its designers earlier but, lesson learned, it has removed their fetters, and they've done award-worthy work. Nissan has improved the Sentra for 2016, but not enough to keep pace with the thoroughly redesigned Honda Civic. Rear legroom, trunk volume, and fuel economy remain strengths, but Honda has largely closed and even eliminated the gap in these and other areas. The Sentra retains one clear advantage: it's quieter, especially on concrete highways. How, then, will Nissan continue to sell over 200,000 Sentras each year? Some people will prefer its more traditional styling. But the primary draw will likely be the actual price after factory incentives and dealer discounts. Though the Nissan's and Honda's window stickers aren't far apart, their actual transaction prices likely will be. People seeking the least expensive car with the interior space they need and the fuel economy and features they want could find their best fit in a Sentra. Very good fuel economy, but marginal performance, and the CVT has a mind of its own. Voluminous trunk. The Civic has caught up in this area, though. Nissan provided lunch and insured, fueled cars at an event for invited media. Michael Smith of Troy Honda (in Michigan) helpfully lent me a Honda Civic for a comparison test drive. A joy to work with, he can be reached at 248-884-0959. 2016 Nissan Sentra pros and cons, according to Michael Karesh: the best reasons for buying (or not buying) the 2016 Nissan Sentra. Join TrueDelta to post your own impressions. Personally, I think the new Civic is hideous - worst in class. Older versions looked good to me. So by comparison, I'd favor the Sentra. Eye of the beholder, and all that.